Apologies to all writers referenced. No ferrets were harmed in the production of this cartoon. However, you may thank liquidambar for the return of the ferrets this week, after clamoring for another critter cameo in last week's Toon Thursday comments. Thanks for the inspiration, writerjenn! I have to say, I almost included "The Ferrets of Madison County" but it just didn't quite make the cut. However, I was kind of looking forward to drawing a picture of a ferret in a prairie bonnet... Oh. One other thing. Just in case that drawing for "The Ferret Whisperer" has completely confused you, simply click here for enlightenment. (I wish you really could "click here for enlightenment"--how cool would that be? I'll tell you--it would be incredibly cool.) Okay, obviously I'm spazzing a little today, so I'll quit for now. My daughter has had a long standing thing for ferrets, so I can't wait until she sees this! I don't know if people will be thanking me or blaming me, but you gave me the biggest laugh I've had all week. 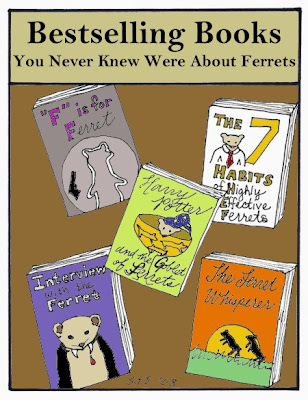 Each title was funnier than the last, and it started me thinking, "The 5 Ferrets You Meet in Heaven," "The Man who Mistook his Wife for a Ferret," etc. 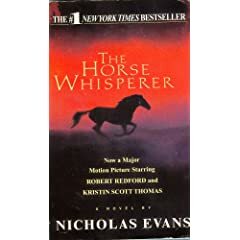 I love those ferrets in the moonlight in "The Ferret Whisperer." Sometimes ya just gotta be silly.